I've never been a big fan of diet drinks (I prefer good old water), and now I'm glad. 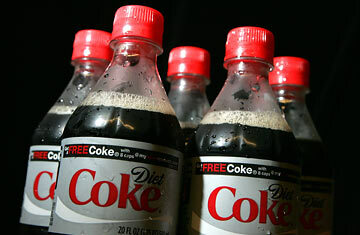 A study conducted by the University of Texas Health Science Center at San Antonio followed over six hundred people ranging from twenty-five to sixty-four years old for up to eight years and found that those drinking diet soda  even as little as one can or bottle a day  did not lose weight and were significantly more likely to become overweight than those who drank regular soft drinks or none at all. How can this be? No one knows for sure, but scientists think that artificial sweeteners, perhaps even the caramel coloring, may muddle brain chemistry. The brain in a sense gets a reward, and the desire for more sweets is intensified. The more of these fake sweet products you eat or drink, the more sweets you want. See pictures of grocery store auctions.